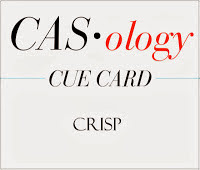 Are you ready for a new Cue Card from CASology? Another fitting prompt for this time of the year. This weekend is the Canadian Thanksgiving and I am heading to the cottage at the lake for a Thanksgiving feast. While the leaves in the city are just starting to turn I know that when I get up there there will be a sea of yellow, orange and red! A lot still on the trees but many many more on the ground, likely covering the road on the way in. So when I think of crisp I think of the sound of the leaves under my feet at the cottage on Thanksgiving. 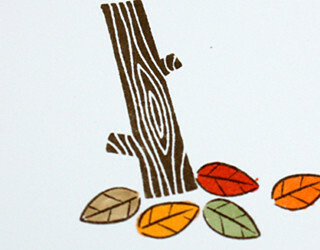 I used Lawn Fawn's Into The Woods for my card, colouring the leaves in with Copics. I can't wait to see what CRISP means to you! Love this - so clean with great pops of colour! Perfect! A clean and crisp card with bright and cheery crisp leaves! And how awesome to spend Thanksgiving in a cottage by a lake! I love this Lawn Fawn set. I love you used the log as a tree! Perfect! What a great CAS card Tracey and I'm envious of your upcoming weekend at the lake. Have a great Thanksgiving. I can hear the crunch of the leaves from your words! Such a CAS card, Tracey! Love it! WOW Tracey, you really take CAS to a whole other level. Well done. I did a long hike yesterday with crisp leaves all along the trail. It was wonderful and your clean card totally brings back that crisp feeling! This is so sweet and I LOVE the sentiment!! Adorable! I think you have made me want some LF stuff for sure! Enjoy your weekend! what a cute card, tracey... perfect take on the cue word! I just love this. CAS perfection. Loveeeeeeeeee this!!! LOVING those leaves!!!! How sweet is this! I love Lawn Fawn, and you have made their images shine. Great colours, Tracey. I can just smell your fall leaves at the base of the tree! Thanksgiving at a cottage sounds heavenly! What a cute design Tracey! Fabulous CAS design! 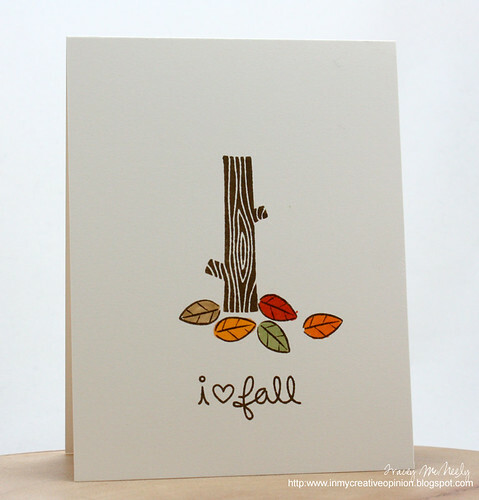 Fall is my favorite season and your card reminds me of those wonderful moments out walking in the leaves. Amazing, amazing, amazing! Not sure how a tree trunk and few brightly colored fall leaves can make you feel the "crispness" in the air but your card has done that...just wonderful. Love every single card and always truly inspired!!! Have the best holiday! 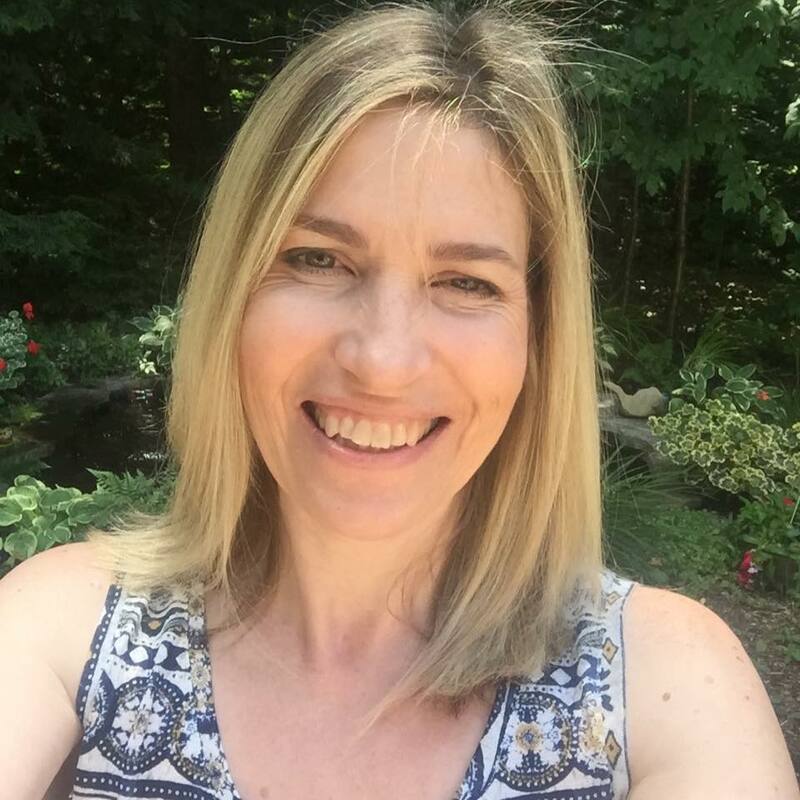 CAS perfection here Tracey - a good example of why I am in awe of you my friend! I love this! How cute! Have a great Thanksgiving weekend, Tracey!!! The cool, crisp fall colors are amazing! Love that you went with less on this card, it really makes the colors pop out. Such a lovely card! Less is definitely more here - big impact. I love this card. What a cute set! I think I need it :) This is CAS at its very, very best! Ack ... wonderful!!! A tree stump with no branches, just fallen leaves ... I don't think I've seen that before. Love it!!! Very effective. your cas designs are so clean and crisp..any of your cards would fit this challenge! Tracey, as soon as I saw your card it made me think of "The Giving Tree" by Shel Silverstein! I love the simple, clean layout of your card...brilliant take on the cue!